On Friday March 23rd, Kilimanjaro Consulting held a seminar for accountants, trusted advisers and other parties at the Hyatt Hotel in Canberra. The seminar was aimed at informing these advisers about MYOB EXO and Kilimanjaro. 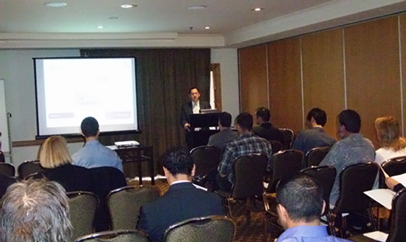 The seminar was a fantastic opportunity for Kilimanjaro to promote the launch of our new office in Canberra. “At Kilimanjaro we pride ourselves on creating strong and long-lasting alliances with our clients. Our company is growing rapidly, and the decision to open an office in Canberra comes as a result of good growth in the ACT. We feel that a physical presence in Canberra will allow us to serve these clients better”, said Managing Director Ronnie Baskind.